So Apple couldn't release its iPhone without also unveiling a new Bluetooth headset and a tweak to their iconic headphones now, could they? Keeping in line with Apple's minimalist design ethos, the Bluetooth headset appears from the side as a simple, thin, 2001-esque, black slab. It only has one button (on the top) and is apparently "incredibly small." Apple has also unveiled a new set of stereo headphones that accommodates the iPhone's cellular functionality. Similar to wire based hands-free kits, it has a small white box halfway up the wire with an integrated microphone and a "squeeze" switch for answering and hanging-up calls. 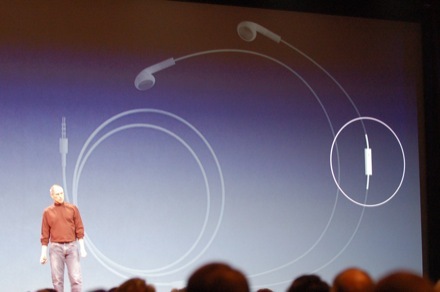 Check out the break for a shot of the hands-free Apple headphones.